The strained relationship between Greece’s two coalition partners appeared to reach a new low on Wednesday following Defense Minister Panos Kammenos’s proposal of a potential alternative plan to the Prespes name deal between Athens and Skopje while on an official visit to Washington. During a meeting at the US State Department on Tuesday with Assistant Secretary of State for European and Eurasian Affairs Wess Mitchell, Kammenos floated the idea of a defense agreement between Greece, the Former Yugoslav Republic of Macedonia and other countries in the Balkans aimed at consolidating stability and curbing Russian influence in the region. Kammenos made his proposal on the basis of a prediction that FYROM will fail to push a name deal with Greece through its Parliament. The vote in FYROM’s Parliament is set for next week and the Balkan country’s Premier Zoran Zaev is trying to draw the additional votes from the political opposition he needs to change the country’s constitution. It soon became clear on Wednesday that Kammenos did not have the support of Prime Minister Alexis Tsipras for his alternative plan. “The Greek government remains committed to the Prespes agreement,” one government source remarked, expressing “respect” for Zaev’s efforts to fulfill the conditions for the deal’s ratification. According to sources, the leaked comment from Tsipras’s office was aimed at Zaev as well as Kammenos, with the authorities keen to be clear that there will be no “plan B” in the event that the Prespes deal fails to secure approval. Meanwhile Alternate Foreign Minister Giorgos Katrougalos told 24/7 radio station that the idea of an “alternative plan” to the Prespes deal had never been broached at any cabinet meetings. Katrougalos also played down the role of the nationalist Independent Greeks (ANEL) party, which Kammenos leads, claiming that the government has a majority of support in Parliament not only for the name deal but for a potential vote of confidence. The rift in the government over the agreement prompted a scathing reaction by Greece’s opposition New Democracy party with a spokesman calling on Foreign Minister Nikos Kotzias to clarify the government’s position on the matter. Shadow foreign minister Giorgos Koumoutsakos asked Kotzias whether there is indeed a “plan B” and criticized Kammenos’s stance in his talks with US officials. “Does he know of an alternative plan which... substitutes the Prespes agreement? If so, who drafted it, whose approval did it receive and where was this plan submitted?” he asked. “And, ultimately, who determines the country’s foreign policy? The minister of defense or the minister of foreign affairs?” Katrougalos also queried whether Kammenos’s statements about curbing Russian influence in the Balkans would undermine Tsipras’s planned visit to Russia later this year and harm Greek-Russian relations. 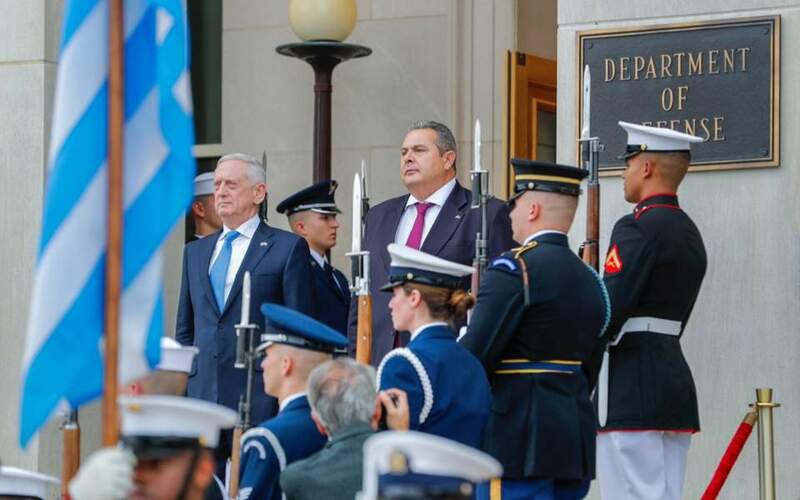 During his visit to Washington, Kammenos also urged the US to increase bilateral security cooperation with Greece, proposing the expansion of its military presence to Volos and Alexandroupoli as well as Larissa.